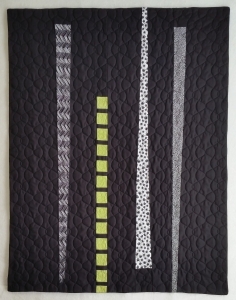 This piece is another of my ‘Modern’ quilts. It features commercial fabrics and improvisational piecing. 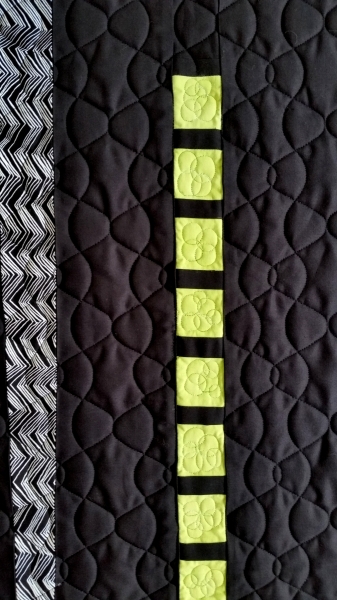 The digitized quilt design in the black areas is based on a traditional Japanese sachiko pattern called ‘steam.’ Edamame are steamed fresh soybeans. I think there is a Pad Thai quilt in my future! Chopsticks and Edamame will be part of the Studio Art Quilt Assciates’ Food for Thought exhibition. The show will debut at the National Quilt Museum, Paducah, Kentucky, in April 2015 and will then travel to the Festival of Quilts in Birmingham, England, in August, 2015. I know, pass the salt, right?